Hello Brown Spice Beauties! I must say, sometimes you stumble across the best products by accident. I was visiting one of my good friend's helping to celebrate her spouse's birthday. Over a glass of wine we started talking, the subject of makeup came up and somehow we ended up in her bathroom in front of the mirror going through the multiple drawers of her makeup kit. 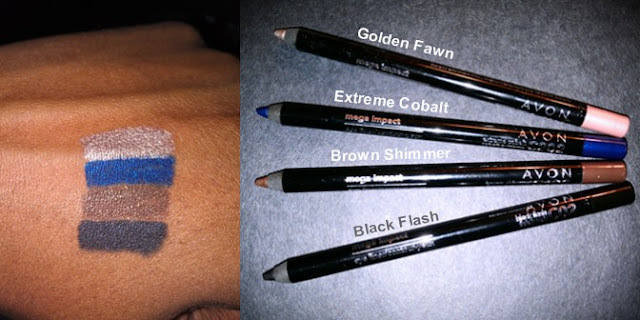 I was trying out all kinds of shadows on the back of my hand to check out the colors when this eyeliner in the most perfect shade of blue caught my eye. It was like the perfect combination of royal and navy blue with a light shimmer. I dropped everything and grab it up. I drew a line on the back of my hand and not only did it go on smoothly and easily, but the color popped and was AMAZING! I instantly had to try the color under my eyes because on my hand was one thing, but the true test was under my eyes. The application was flawless. Very creamy and easy to apply. I did not have to press hard or pull the sides of my eyes to get the color to go on. I was in LOVE! Me on my way home after trying eyeliner for the first time. I had not even paid attention to the brand of the eyeliner because I was too busy in the mirror loading it on. My friend said it was by AVON and I was floored. Not that AVON does not have great products, but I have not purchased anything from them in years and I guess they were never really on my radar when it came time for new makeup purchases, but they are now. The eyeliner is AVON's Mega Impact Eyeliner. It is available in 4 amazing colors: Golden Fawn, Extreme Cobalt (The one I first fell in love), Brown Shimmer and Black Flash. They are only $6 each and I have every color. You have seen the Extreme Cobalt in my earlier photo, now take a look at how the other colors turned out. I found all colors work very well on my deeper skin tone. However, the Golden Fawn color was very hard to get to show up as a liner, as you can see in the photo above. It worked perfectly as a highlighter and inner rim color to give you that wider eye look. I think I will reserve it for that purpose. I have to say that this is, by far, one of the best eyeliners I have ever used to date at such an economic price. The colors are true and application was a breeze. Consistency: Very creamy gel formula. Easy to apply. Pigmentation: Excellent! Translates very well on deeper skin tones. Exception: Golden Fawn which works best as a highlighter or inner rim color. Longwear: Even though they do not advertise it as long wear, it certainly is. I tested the swatches on my hand under water and rubbed them much harder that you would under your eyes and colors did not budge. I give this a BSB Spice Rating: HOT! I think it is well worth the buy at such a low price. There have been some reviews that the eyeliner is hard to sharpen when the time comes. Well, I had to sharpen one of mine and it was not difficult to sharpen, but I could not get a nice sharp point on the tip like it originally had. Several users suggested to put the pencil in the freezer for a few minutes before sharpening. I think I will try that next time. If you own this eyeliner or decide to try it, make sure you post a comment and let us know what you think.